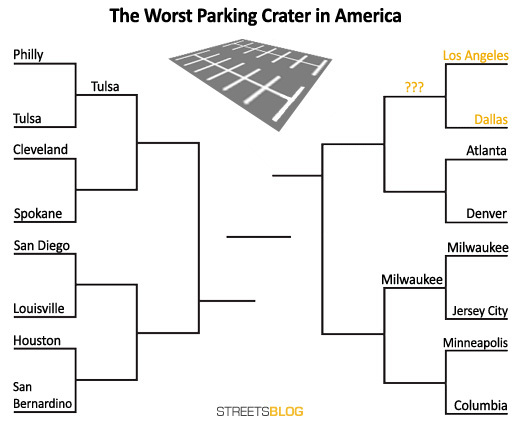 Streetsblog’s own “Sweet 16” of the worst downtown parking craters in America — Parking Madness! — continues today with two cities that grew up in the auto age. Known for their mega-highways and congestion, Los Angeles and Dallas have the parking scars to go along with all those cars. The Civic Center area is home to Los Angeles’s city, state, and federal government buildings. Located a mere two blocks from City Hall, and basically adjacent to the busy “Civic Center” subway station, this particular lot is a true abomination on the L.A. landscape. While some sanity is coming to Los Angeles’s parking policy, the city has a long way to go. Consider this image, put together by Gehl architects, showing a shocking 545 acres of parking lots within 1 km of the Figueroa Corridor connecting Downtown Los Angeles with South Los Angeles. A new building — the Perot Museum of Science and History — has actually sprouted up in this parking crater, but it might not actually be much of an improvement to the public realm. James Howard Kunstler singled this area out in his ongoing “Eyesore of the Month” feature, calling it “a wilderness of surface parking, freeway ramps, and pointless ambiguous ‘green spaces. 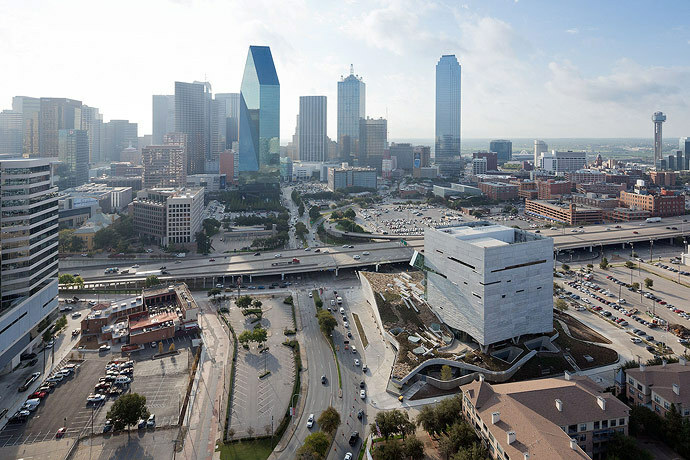 '” The Perot Museum, designed by starchitect Thom Mayne, was no doubt meant to demonstrate Dallas’s civic might. Last week, Tulsa triumphed over Philadelphia (which was also disqualified for technical reasons), and Milwaukee mopped the floor with Jersey City. While the NCAA tournament takes a breather, the action never stops on Streetsblog. Tomorrow’s match-up: Louisville vs. San Diego. This is the hardest one yet! Both extremely impressive craters. LA grew up in the auto age? That’s not what I learned from Who Framed Roger Rabbit! I’ve visited Dallas. It’s basically one giant parking lot, and you traverse said parking lot via freeways. You’d never know that Dallas has the largest LRT system in the country by route-miles. Aided by Kunstler’s never-failing wit, my vote goes for Dallas! Why is Providence not in the running for this? Sadly, I think it’s deserving. No mention of the monstrosity called the Walt Disney Concert Hall in Los Angeles? It’s 2,265 seat theatre has 2,188 parking spots — meaning they expect 96% of attendees to drive to the concert by themselves. And, add that each spot cost $50,274.22 of public funding to construct. And ,since they charge $9 a spot for an event, it will only take 5,586 events to pay for the construction of each spot. Indeed, the one thing LA has going for it is that much of the city proper (and surrounding cities like Santa Monica) grew up in the streetcar age and is relatively dense, with pockets of walkability. At least the Disney Hall parking lots are mainly hidden out of sight, where they don’t directly destroy the pedestrian streetscape. However, those surface lots in the image above are the streetscape one walks through to get from the Civic Center subway station (visible at the west corner of 1st and Hill) to the hall itself (whose grand staircase is just visible at the upper left corner of the image). I think the ultimate winner should go head-to-head with the moon’s Tycho crater in a sudden-death overtime match! This is a really inspired feature – thanks for doing! Where did they ultimately park the moon buggy? A lot of the lots around DCH are slated for development as the Grand Avenue Project finally gets underway. 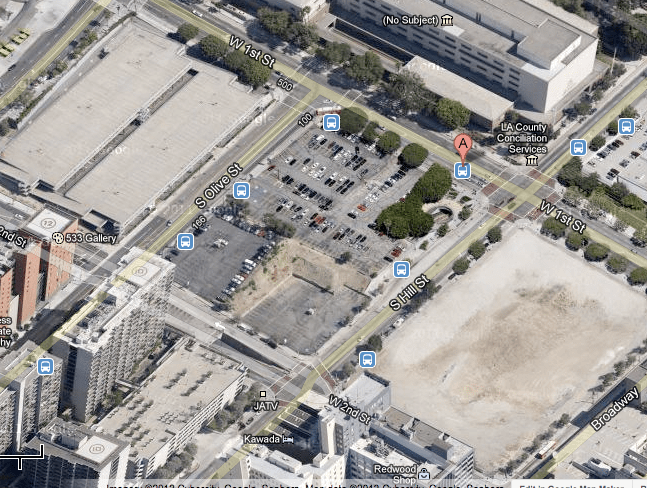 The other open lot in the picture, between Hill and Broadway, is slated to become a new federal courthouse. That doesn’t really say very much though—Kunstler considers anything built after about 1850 to be an eyesore. I t has to be LA because the building is a Civic Center! means that it is supposed to serve citizens yet it is separate from the City .. This is a tough one. Both Dallas and LA have been working towards parking superiority for decades. But I’m going to have to give it to Dallas for the additional bump that the freeways give to the depressing scene. Downtown Columbus, Ohio should have been included in this. With over 100 acres of urban renewal, a mote of Interstate Highways, and terrifying fast and wide State Routes instead of streets, it’s more parking lot/highway than downtown. I believe a good amount of the parking at Disney Hall is used for juror parking on weekdays, so at least it’s well utilized in between concerts. Now, as to whether the court system is paying rent to Disney Hall for those spaces, I have no idea.